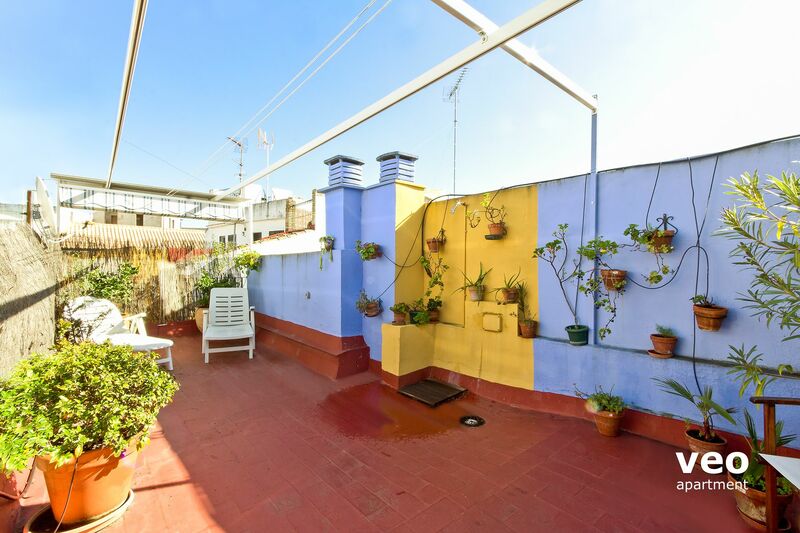 Duplex apartment with 2 bedrooms, 2 bathrooms and a private roof-terrace. Suitable for up to 4 guests. 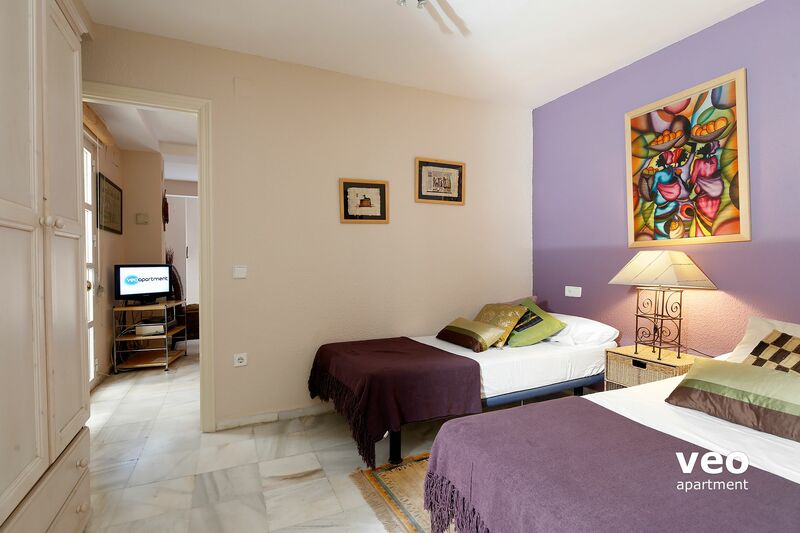 It is located in the heart of the city of Seville, close to Santa Catalina church and Plaza de la Encarnación. 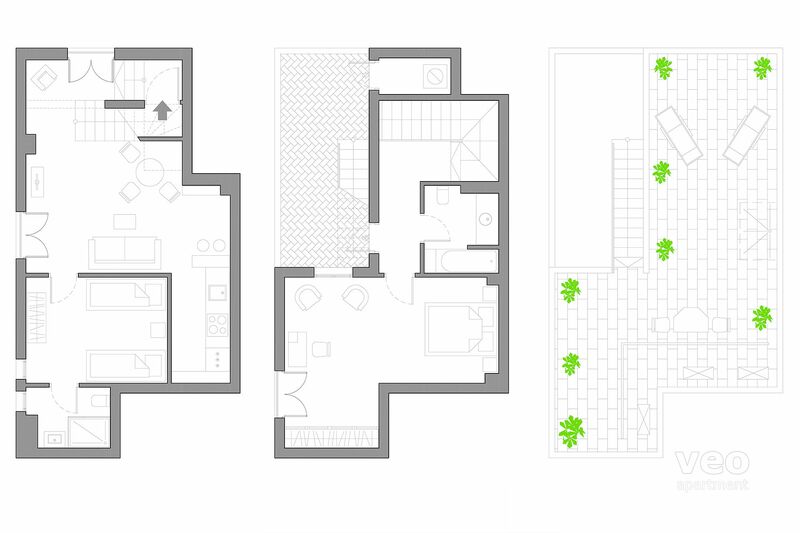 The apartment has inside 95sqm + outdoor space. There are 2 main levels. Level 1: Living room with sofa, dining table and chairs. The open-plan kitchen is equipped with all main utensils and appliances for self-catering - with oven, dishwasher and washing machine. Just off the living room is the first bedroom. 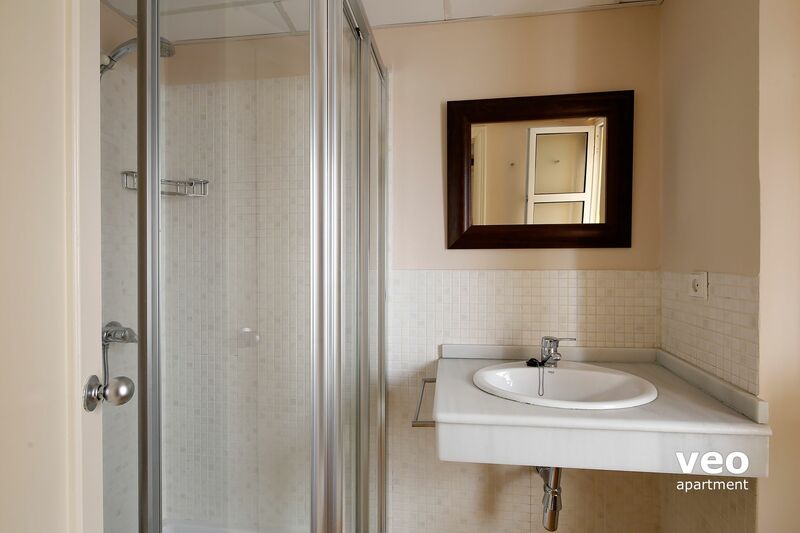 With twin beds, a wardrobe and en-suite bathroom with shower. Level 2: Master bedroom with a double bed (160 x 200cm - U.S. Queen size), large built-in wardrobe and a seating area with desk and chairs. Next to the master bedroom is the second bathroom including a bathtub with an overhead shower. 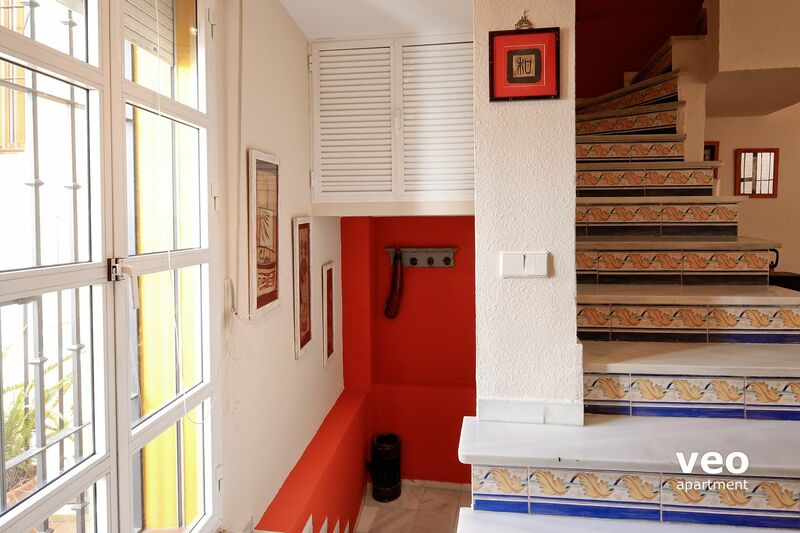 Roof terrace: An iron stairway leads to the roof-top terrace, from the second floor. Terrace equipped with canopy, table and chairs. There is an outdoor shower for the hot summer months. 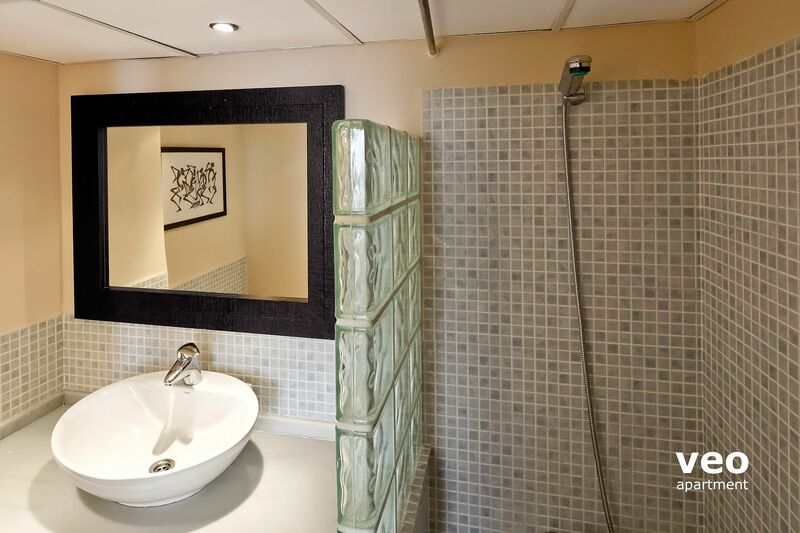 Other features include free wi-fi internet access, flat-screen TV, DVD player, central air-conditioning (hot/cold) and telephone (see conditions). 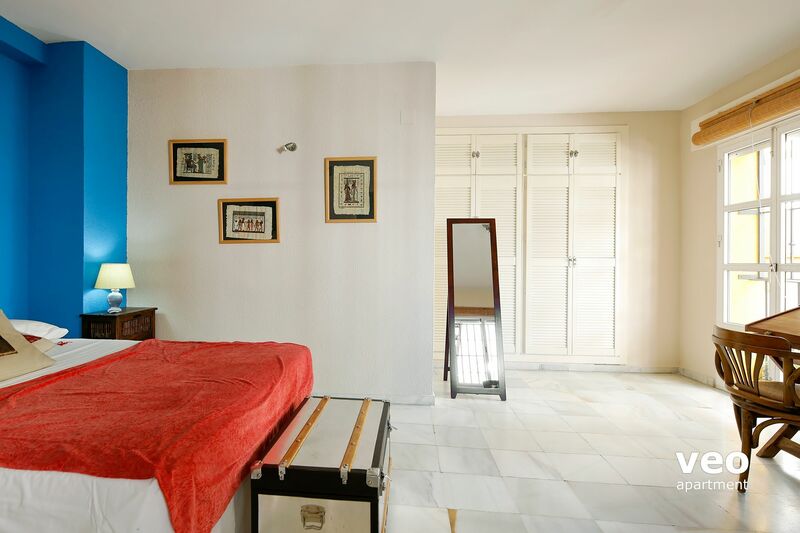 "Santa Catalina" apartment offers a high degree of privacy with your own bedroom and bathroom per each floor. The electricity consumption is billed extra, according to the original supplier invoice, or, if not available, according to the counters (0.20 EUR /kWh). For this purpose, a deposit of 150 EUR is required for each reserved month. The deposit has to be paid in addition to the rent amount, and will be refunded on your second last day, discounted the electricity consumption. Other utilities, as water and gas, are included in the rental price. Baby cot: 25 EUR. (1-7 nights). Please request on your booking form. Telephone: Land line telephone from where you can make free national calls, and receive calls. Terrace: There is one person entrusted by the owner, who looks after the plants in the terrace. Specially in the summer months this person will need to water the plants regularly. Day and time of his visits will be agreed on arrival. This applies mainly to longer stays. What a great apartment! From the perfect rooftop terrace to the most well supplied apartment. Everything was great. It really did feel like our home in Sevilla for three wonderful weeks, thanks very much. Todo está perfecto para estar alojado. 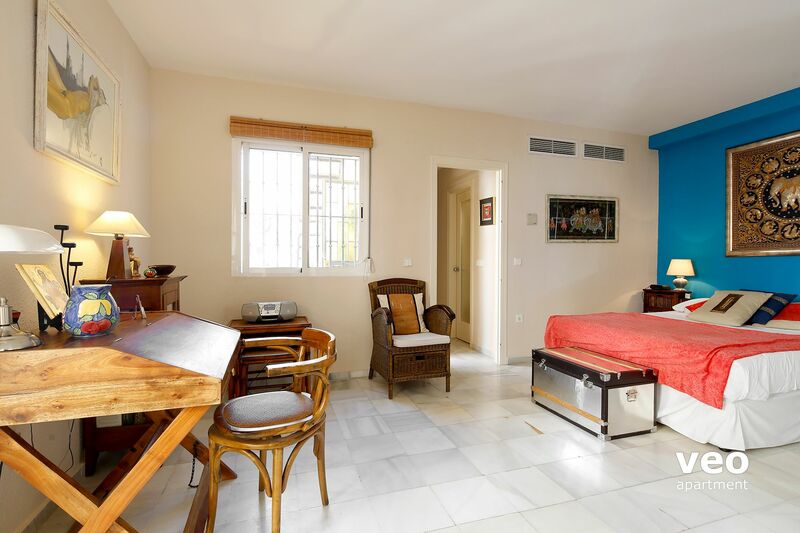 "Super, well equipped and confortable apartment"
We were so pleased with Santa Catalina Terrace. 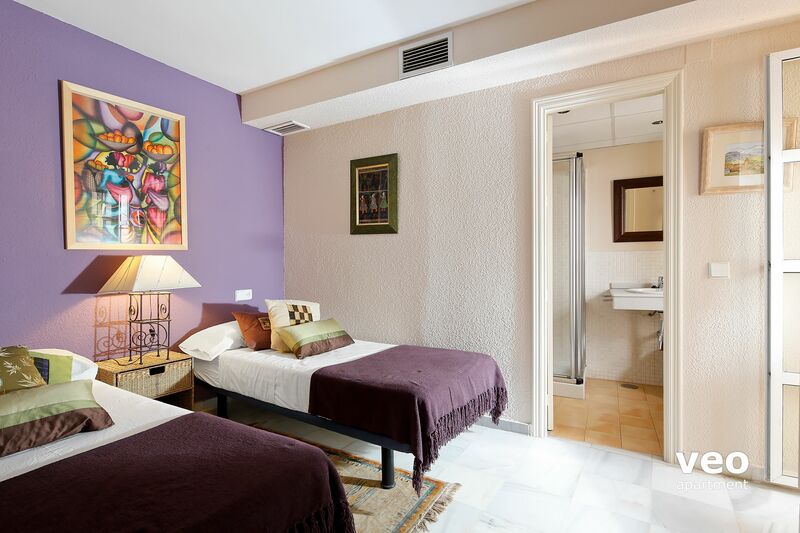 The position was good within easy walk of a supermarket and Feria Market. All the main sights were easy to reach by foot. The beds were comfortable and the kitchen so well equipped. We sat on the roof terrace for apéros- wonderful. All the staff at the veoapartment office were so friendly and efficient. We would definitely recommend the company and apartment to friends. 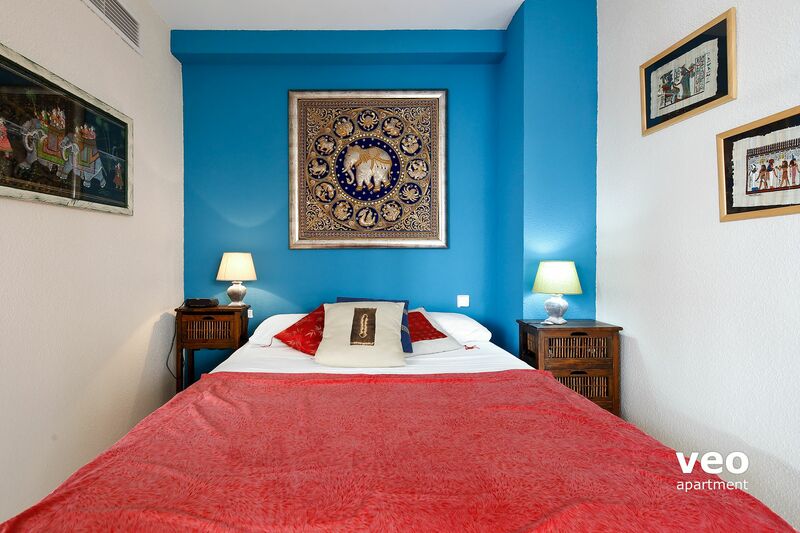 Well equipped apartment whose central location means that all the major tourist attractions are within walking distance. I would certainly recommend to friends and family. Finally, we booked our airport transfers with Naturanda who were recommended by you. Excellent service provided by polite drivers in quality vehicles. Would recommend to others. "Lovely Stay at Santa Catalina"
Apartment was very clean, and pretty much as advertised on this website. The keys are slightly confusing but we figured it out. 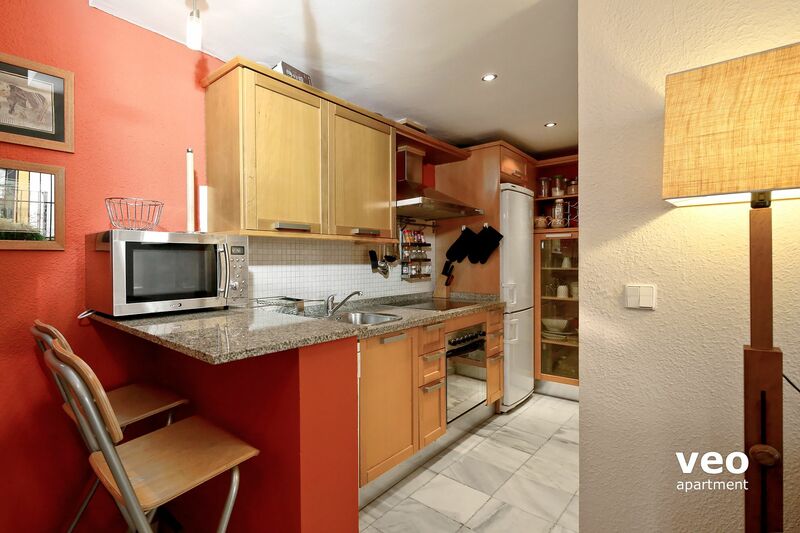 "Très agréable appartement, bien situé"
Un appartement bien équipé, que ce soit pour la cuisine (tout pour cuisiner, prendre les repas), les chambres (confort), le chauffage, les salles de bains, la terrasse : nous avons eu la sensation d'un appartement prêté par un ami qui y vit régulièrement. La situation dans une impasse à deux pas du quartier de Sta Clarina était parfaite : calme tout en étant proche de tout (Gare, vie nocturne du quartier, veille ville Sta Cruz etc). Gracias por la confianza que han demostrado a sus inquilinos y que nos permitió vivir en un apartamento, bien equipado y muy agradable. Bravo por las plantas que están en buen estado y se añaden al encanto de este apartamento. 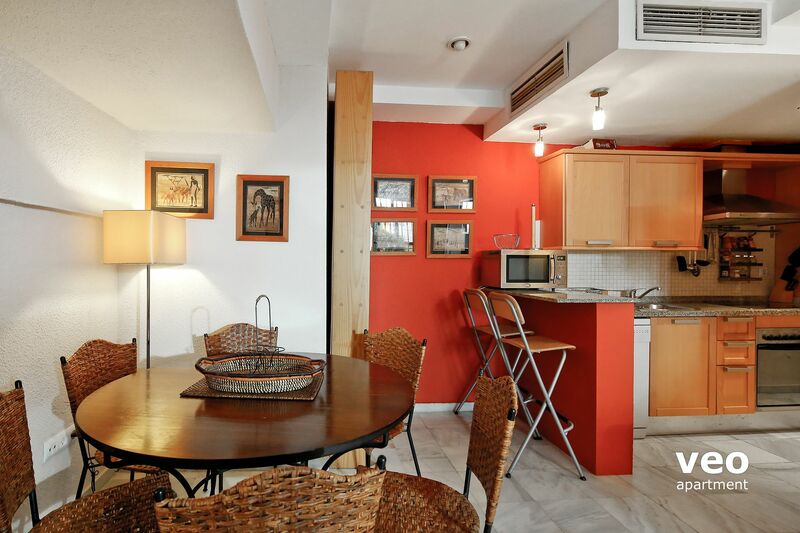 "Great location, very good facilities in the city of sunshine, oranges and flamenco." We stayed for three weeks in December 2015 and had a great time. The apartment contributed enormously to this. 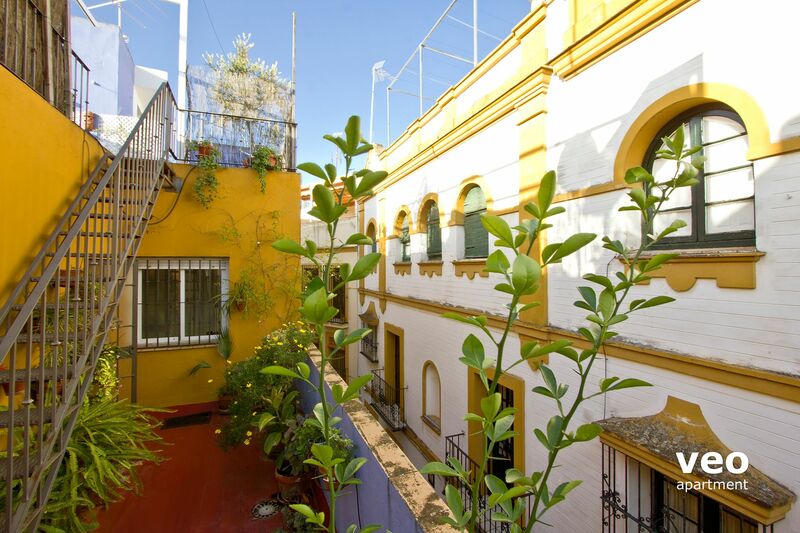 It's situated close to all the major attractions and within a minutes walk of one of the most historic Tapas Bars in Sevilla - El Rinconcillio. There's a baker's shop very close by that seems to be open every day. It's an easy walk to the market on Feria and there are loads of smaller shops nearby. Die Wohnung ist geschmackvoll und gemütlich eingerichtet. Sie erstreckt sich über drei Etagen, wodurch es einige Treppen gibt, was uns aber überhaupt nicht gestört hat. Die Küche ist gut ausgestattet und die Matratzen sind in Ordnung. Sie liegt zentral und trotzdem ruhig. Alle Sehenswürdigkeiten sind fußläufig zu erreichen. Ein Bäcker ist direkt um die Ecke, genau wie einige gute Restaurants und Tapasbars. Auch ein Supermarkt ist direkt in der Nähe. Die Dachterrasse ist super. Es war schön dort zu frühstücken oder den Tag ausklingen zu lassen. Den Mietwagen mussten wir ins Parkhaus stellen, da es so gut wie unmöglich ist in Sevilla einen Parkplatz zu finden. Das Parkhaus ist nur ein paar Meter entfernt und kostet 60 für 5 Tage. Die Organisation von Veoapartment war sehr gut und die Schlüsselübergabe klappte problemlos. Wir würden die Wohnung sofort wieder mieten. 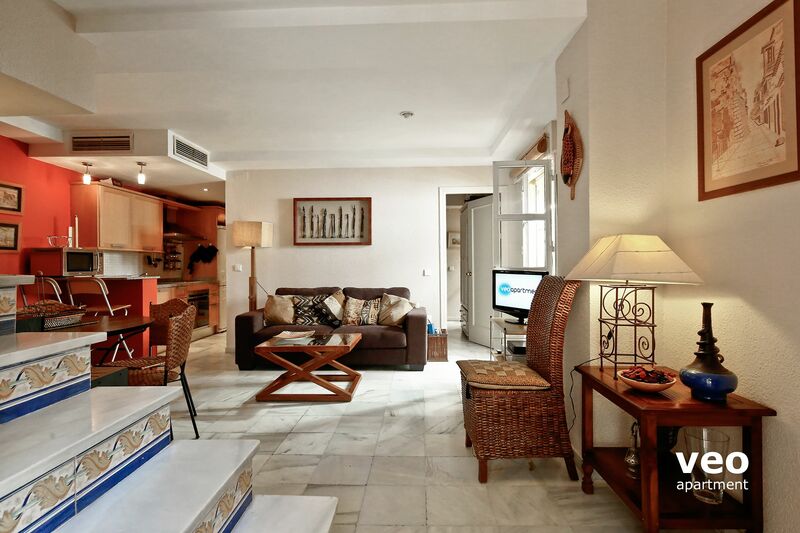 "Wonderful stay with a little blip"
A beautiful apartment which was well situated. 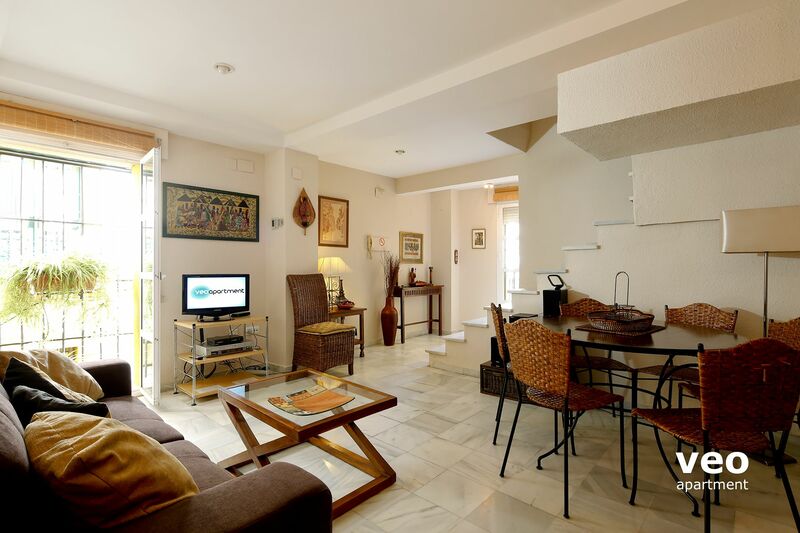 Everything you might need to make your stay comfortable and like home was in this apartment. As well, the art works and books were little treasures. While there was a problem with the air conditioning in the bedroom upstairs, the owner did everything possible to mitigate the problem. Had veo apartments and their representative, responded to my first email more promptly, the problem may have been rectified in the five weeks we were there. The owner did provide a good restitution to us because of the problem. Owner's reply: We are happy you enjoyed your stay in our apartment and sorry again for the air conditioning issue. It has been very difficult to arrange a meeting with the aire conditioning company, particularily busy in this period of the year. The problem is now solved. Thank you very much for your comments. 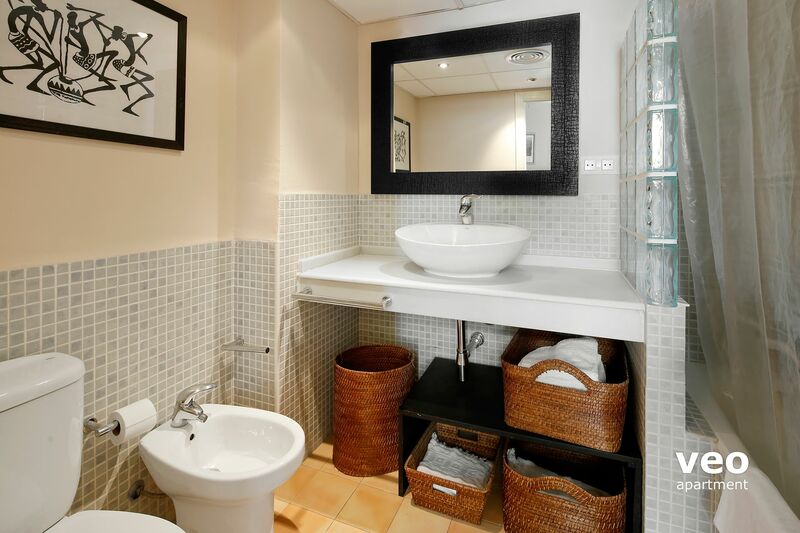 "Convenient for the city centre, well-equipped & in a good location"
"Beautiful home and thoughtful set up." We thought the apartment was set up in a very comfortable way, great decor and lots of thought went into the set up. "Nice 2-level apartment in good location"
Apartment is excellent for 2 couples or a familj of four, with one bedroom one bath upstairs and a similar slightly smaller set downstairs at the kitchen/dining room level. Kitchen was well equipped and all appliances worked well. Apartment is a bit dark as all windows face another building in a narrow alley. Concequently, there's no car traffic outside, but human talk/laughter from the alley and some traffic noise from nearby streets filter in nonetheless. Location is excellent, just outside the central Santa Cruz area. Plenty of local bars and restaurants are around the corner. Only minor nuisance was getting in and out as apartment is behind three to four locks (you even had to open two doors with keys to get out). 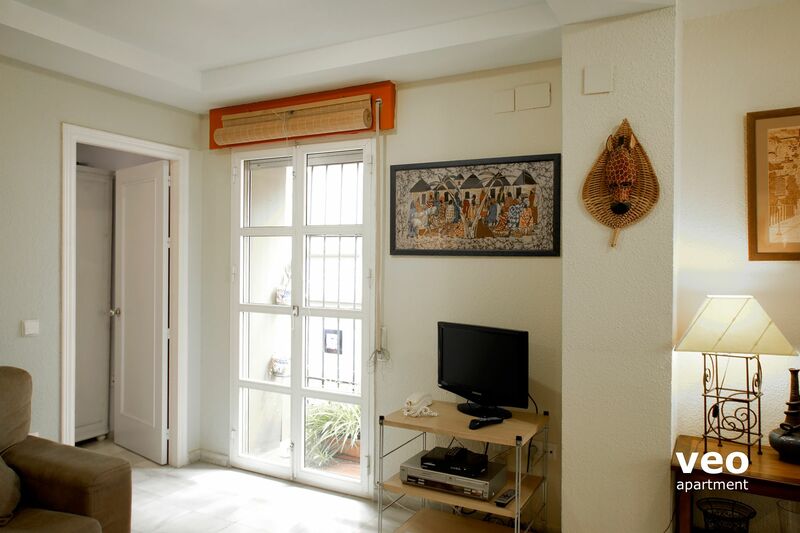 "Lovely apartment in a great location"
Lovely apartment in a great location, with some fantastic tapas bars close by. Drainage system should be looked at as the bathroom shower could not be used and whilst the terraces are lovely could do with a good clean. 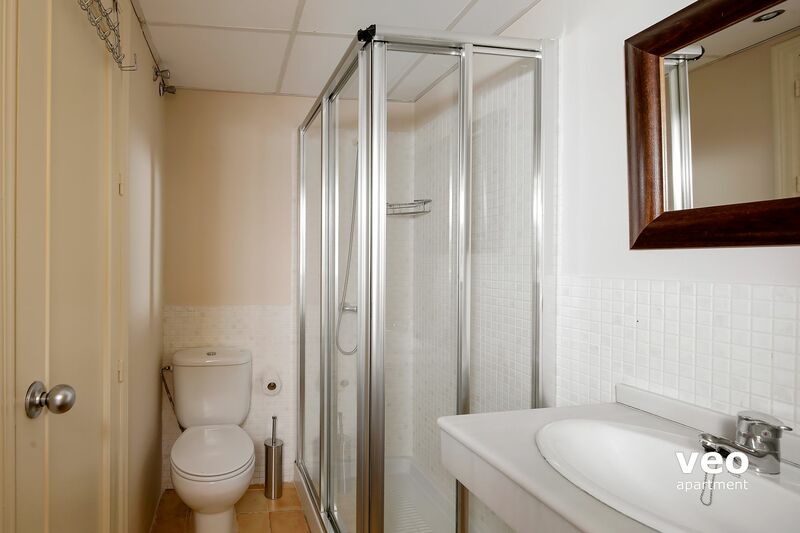 Owner's reply: The drain of the upstairs' bathroom has been fixed - thank you for advising. Regarding the terraces, these are cleaned just before arrival. But the automatic plant watering and the dry leaves that fall down may require a daily maintenance. Anyway thank you for your feedback and as I said the bathroom's drain is already solved and we'll ensure that the terraces are always ready before arrival. Regards. 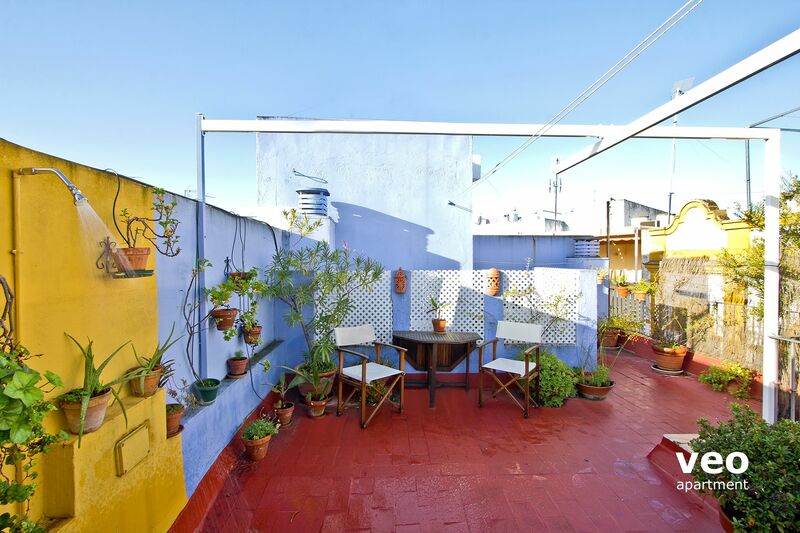 "Great location with good sized private terracce." 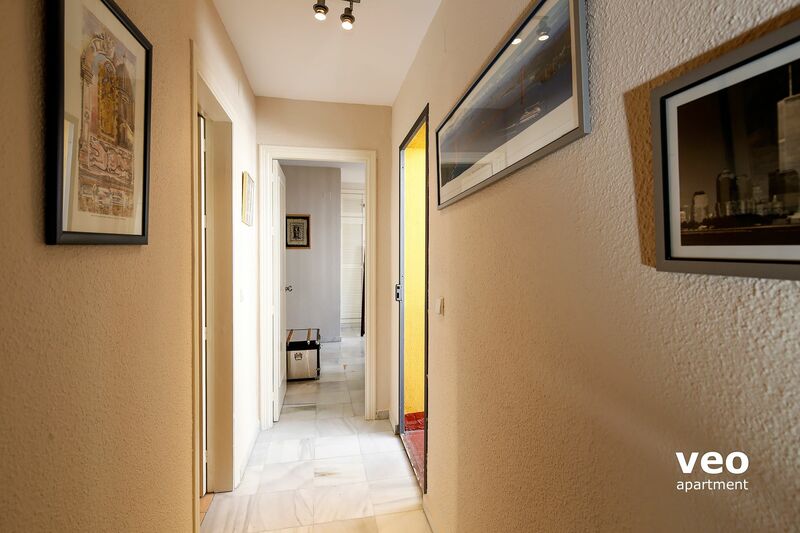 Great apartment for two couples ie 2 bathrooms . Good location and yet reasonably quiet. 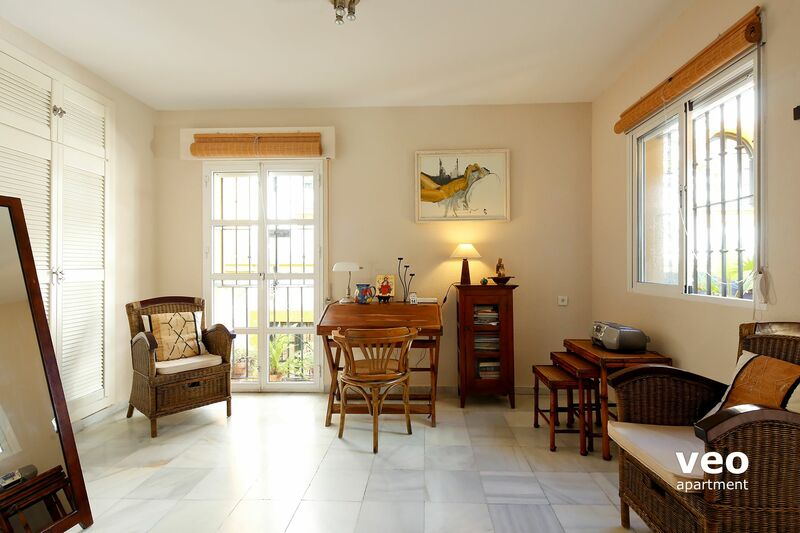 Very well equipped and obviously an apartment that is used by the owners which makes for a more cosy experience.